With A.J. 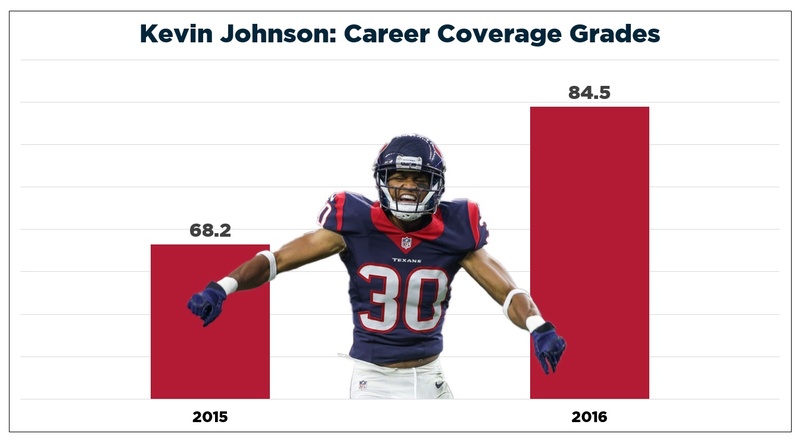 Bouye leaving via free agency, the Houston Texans will be once again leaning on Kevin Johnson, who took big strides in year two (68.2 to 84.9 in overall PFF grade), but was limited to 286 total snaps. Johnson didn’t allow a touchdown over the first six weeks of the season before injury struck, having surrendered eight during his rookie season. He also wasn’t beaten for a reception longer than 31 yards over those games. Johnson’s numbers improved dramatically across the board in his second season before injury sidelined him, yet he has just one career interception in the NFL.